- Frequency where maximum attenuation is required. - Amount of attenuation needed. - Installation environment and mechanical attachment requirements. 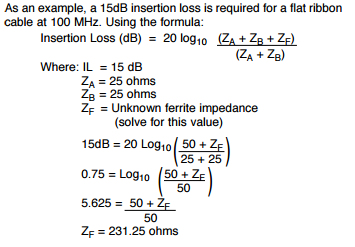 The frequency range requiring attenuation must be matched to the performance of a given ferrite composition (figure 1 on previous page). The optimum profile would be a ferrite in which the highest attenuation level coincides with the disruptive frequency (A). That same ferrite could be used even if the frequency falls in a lower area of its impedance curve (B) but there would be correspondingly reduced attenuation. Conversely, a different ferrite formulation could be employed in the same frequency situation with the intent of using a lower part of its performance curve (C). Space and weight considerations are not normally a concern since good quality ferrites provide high performance per a given cubic volume. With a high circuit impedance, it may be possible to increase the number of turns or passes through the ferrite (figures 3 and 4), or to use a larger amount of ferrite (cubic volume) in the circuit in order to achieve the same level of insertion loss (fig. 2). By increasing the number of turns (passes) through the ferrite opening, the “effective magnetic path” is increased _ impedance then increases by the square of the number of turns (N2 ) ; i.e., two turns (22) = 4 times the impedance. 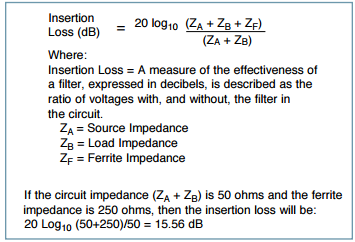 When additional ferrite volume is added, impedance increases on almost a direct percentage basis; i.e., a 100 percent increase in volume will provide about 100 percent increase in impedance (figure 2) in most situations according to certain prescribed dimensional ratios. An alternative modeling procedure may also be structured in reverse by solving for a desired insertion loss goal. The result yields an impedance requirement. This can be matched to known performance profiles of existing ferrite configurations in the geometric style best suited for mechanical and packaging requirements. Next, refer to the Attenuation Properties on page 36. The flat ribbon cable style part that closely matches is #28B2480 with a 250½ impedance at 100 MHz. Once the ferrite suppressor is installed in the circuit, results should be confirmed by testing. Although these ferrites are “linear,” the term is relative to the common operating range of temperatures. The permeability is different at every degree of temperature. The published initial permeability (µi ) nomenclature applies to standard temperature, 59°F (15°C) only. There are only minor impedance differences, however, throughout normal operational ranges and up to 180° F (82°C). See Material Properties on page 33.